As part of your membership package the BMC provides Combined Liability insurance for Clubs and Individual members, and Personal Accident cover for Individual members. Details of the Combined Liability insurance and Personal Accident insurance can be found on our broker's website, along with claims forms and FAQs. This is not a comprehensive travel policy, Travel insurance cover is also available to members along with financial protection through Summit Financial Services. Club members do not benefit from Personal Accident cover ??????????? I am a British passport holder and British Citizen resident in Kenya. Please can you can confirm I am entitled to join BMC but NOT entitled to insurance through you ? Hi my son is a ski instructor and into other mountain and climbing activities, I am thinking of giving him BMC membership as a gift. Although a UK resident he is not often here, will he still eligible to all the membership benefits. 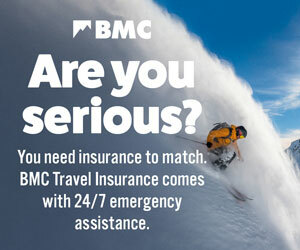 Hi BMC, I suggest you need to update the image on the Combined Liability Insurance page. the current image (5/3/19) references the old broker, not Howden.